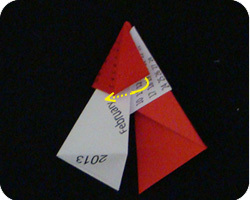 Carmen Sprungs Star Calendar was originally made as a origami star. This particular type of origami is called modular origami because you make many units (all the same) and then assemble the units into the final model. Sara Giarruso converted the Star into a calendar by strategically placing the months and years so when assembled, they represent the months of a calendar year. This is not an easy task because this origami star has many overlapping pieces of paper; the positioning of the days and months must be exact. To this day, creating the following year’s calendar is a challenge and needs to be done manually. 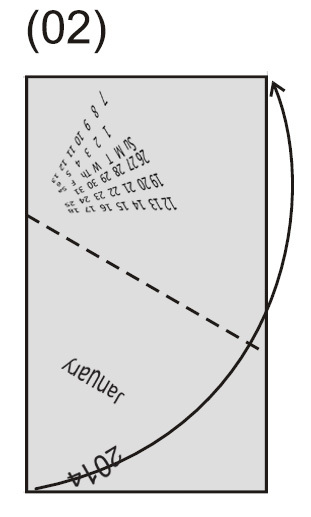 Instructions on how to fold the Star Calendar will not be repeated, rather, we direct you to the original diagrams available from Carmen Sprungs web site. Instructions are in German so be patient with yourself and study the images; the results are worth it! 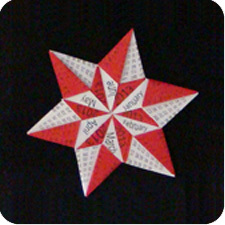 Once you have folded all 12 units, it is time to assemble the pieces into the star calendar. To assemble the pieces together, you can follow the photo instructions from this web site. You can also refer to textual instructions from cdo written in English. 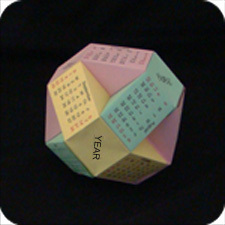 If you are having trouble folding your own origami calendars, you can always buy a page-a-day calendar from amazon.com. These calendars are fabulous gifts because there is one origami model per day: it’s a gift that will last the entire year.